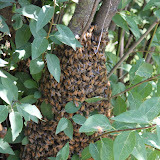 Went out to the bee yard yesterday to check bees. Well... sort of. See I started to go out and check the bees, then realized that I better make up some frames first. Had some trouble with equipment, then got some frames built. 50 to be exact! My wife came out and offered to help. What a blessing!!! See she is a very hard worker and really likes to complete a task. Now, I was only going to build a few frames, but with her helping, we whipped out all 50 frames in record time. My daughter even got in on the act and helped mom glue and then later sorted them into hive bodies for later use. After my equipment malfunction, it would have been very late before I would have gotten them put together, so many thanks to my great wife and wonderful daughter. I could have not done it without you! Well after the equipment fiasco and then getting the frames put together, I finally made it out to the bees. I thought I would just do a quick cursory check on a few of the hives. The first hive I checked was one that we split about 2 weeks ago. I am happy to say that it looks like they successfully raised some new queens, the new queens emerged and the girls seemed quite content. Still lots of capped brood ready to emerge any day. The top deep was almost completely full of honey in the brood area. This is a very common happening when a hive is queenless. So, at my mentor, Jeff Maddox's suggestion I dropped 2 honey supers on top. Jeff said as soon as the mated queen returns the bees will sense that she is ready to get busy laying and they will want to clear that brood chamber for her, so, put the two supers on top and... instant honey crop! Hope this works, as it will provide a wonderful start to our 2012 honey harvest. That means all our customers can hopefully reap the benefit of some early season honey. OK, so now for the, "oh no!" While the first hive I looked at seemed so great, the second hive I got into was in quite the opposite situation. See this hive is one that I purchased from a friend (mentioned in an earlier journal). Not that in it's self is bad, but the situation is that I haven't checked them yet to see how they were doing, and this hive was ready to swarm. There were already some queen cells built and almost complete. I got worried... Not just for this hive, but for the 5 others that we all new purchased and also unknowns. It was getting lat in the day and I decided that the others would have to wait till in the morning. I quickly split this hive into two and hopefully have averted the swarm issue. 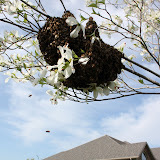 We definitely don't want what happened to another hive (pictured above) to happen to this one.